This delightful stone barn conversion offers a spacious living area on the first floor with a fully fitted kitchen, 2 bathrooms with shower above and 2 tastefully decorated bedrooms. The property has its own private enclosed garden with a garden room, but also shares the communal courtyard at the front. Mill Corner is beautifully presented by the owners who have spent considerable time creating an absolutely delightful place to stay in this amazingly peaceful location. The Ruthern Valley is one of Cornwall's hidden gems where leafy woodland overhangs quite country lanes in a little visited area. It is so quiet, yet just a 10 minute drive to the centre of Wadebridge and within 1/2 hour of countless beaches, attractions and places to visit on both north and south Cornish coasts. First floor: Landing at the top of the stairs with doors leading to: double bedroom (5ft bed) with en suite bathroom with bath and shower above. Also from the landing is a door leading to large open plan living area including fully fitted kitchen, lounge with wood burning stove and dining area and separate WC. Exterior: Private enclosed garden to rear, shared courtyard at front with exterior furniture and BBQ facilities. Parking in designated bays. Heating is via electric radiators and the woodburning stove. The kitchen is fully fitted with a range of units. There is an electric oven and hob, a microwave, toaster, kettle, fridge/freezer, dishwasher, washing machine/tumble dryer. The lounge area has a digital TV & DVD player, CD & Radio. There is free WiFi at the property. There is an iron, ironing board, cot and high chair. Electricity, heating, bed linen and towels are all included. Mill Corner has a woodburning stove and your first bag of logs is provided free of charge. Up to 2 dogs may stay at the cottage free of charge (more upon arrangement - please call us), although please remember that you cannot leave dogs unattended alone in the cottage. Strictly no smoking is allowed. There is off road parking for up to two cars. Short breaks are available as last minute bookings or during the off season. Great place, great cottage. Many thanks. Loads of extra items left for your connivence, short drive to Bodmin. Thoroughly enjoyed our stay at Mill Corner. The cream tea that was left for us when we arrived was so very thoughtful. Comfortable, clean and superb location for day trips out and about. Especially the Eden Project. A pub within walking distance would have been the cream on the cake. We were happy with our stay at Mill Corner. The garden was lovely and secure for our dog. We were very pleased to be met with scones and cream on our arrival. The kitchen had everything we needed and towels and soaps for us. We'd contacted the housekeeper about our arrival but our call was never returned so contacted Cornwall Cottages who were extremely helpful. We found it better to go direct to them about a couple of very minor issues that did not affect the enjoyment of our holiday. Nice cottage ..as long as you don’t mind the narrow lanes! Mill Cottage is comfortably furnished and felt homely. Well equipped kitchen. Lack of coat hangers! Four for each room seemed very stingy. They were oddments too! Do the owners expect visitors to bring their own? Heated towel rails in the bathrooms weren’t working. Presumably because the electric storage heaters weren’t in use and they are part of same system. Contacted the housekeeper on number provided- she didnt know anything about the heated towel rails. Suggested I messaged the owner, which I did, but didn’t receive a reply! There was nowhere to hang towels to dry! Not even a clothes airer. Weather was unsettled during our stay, so no point hanging towels outside to dry, while we were out all day. The bath towels in our room were obviously brand new, plastic tags still held them together. They hadn’t been washed prior to use and had an unpleasant smell. We were in the ground floor bedroom which has French doors, but no window. The bathroom had an expelair which activated with the light, but unsure if it was working as made little difference to the airflow. Information file was incomplete- appliance instructions missing; no information about recycling collection, so all went in black bag! We were prepared for the narrow country lanes, which are common in this area. What we weren’t prepared for was the sudden upsurge in volume of traffic, when the Royal Cornwall Show started, for the last three days of our stay! We soon realised the lane which passes the cottages was a rat run to Wadebridge, to avoid all the queues on the main roads making for the show. The majority of the cars we encountered were showing lime green stickers denoting official entrance to the show - possibly judges, exhibitors etc .... and we were trying to negotiate the route travelling in the opposite direction! To encounter upwards of 40 cars in the space of about 3 miles, each morning and afternoon, often travelling far to fast for such a narrow single track lane, made for some very tense moments, and marred the enjoyment of our stay! On the basis of the location alone, we wouldn’t choose to holiday here again. Thanks for the detailed review. We will replace missing coat hangers at the next changeover. The towel rail switch is in the kitchen and instructions for use are in the guest file. We take your point about greater use of towels in the summer so will make information in our guest file easier to find. The summerhouse window was chipped by a stone from gardener's strimmer immediately prior to your arrival which gave as little opportunity to repair. The glass will be replaced at the next changeover. As owners, we take our guests' experiences of Mill Corner very seriously, and apologise if you were unable to contact us during your stay.... mobile phone reception in Cornwall can be unreliable, but our letting agents are always available to help. As for the show traffic, clearly there is nothing we could have done about that, but we will advise guests in future of the show dates. The cottage was a real home from home with a really peaceful garden. The cottage had everything we needed and more. We had a lovely cream tea to welcome us on arrival. There were lots of torches and candles, which were a real bonus after a thunder storm and when the hot water cut out after this, the owners were incredibly helpful and very friendly on the phone and it was resolved for us straight away. The garden was lovely, with so much space for our girls to enjoy. We'd definitely recommend staying here and hope to return in the future. It's a great area being quite central to both the north and south coastlines. Beautiful cottage excellent value . Could do with more lighting in dining area. Not to be taken if you don’t like narrow lanes. We took this as a last minute booking property is excellent quality large rooms and brilliant for dogs as garden is totally enclosed. Property was really clean and well stocked and owners left us a lovely cream tea. Parking was an issue at times as others parked thoughtlessly . Only down side is access to property is access although it should have been obvious to us but the narrow lanes for my wife were a bit too much. Withiel is situated about 5 miles from Wadebridge and 15 miles from both Newquay and Padstow. The Atlantic Coast of Cornwall offers some of the most picturesque and breathtaking scenery in the country with golden sandy beaches at 25 locations within 20 miles from Mill Cottage; these include Crantock, Fistral, Perranporth, Polzeath and Watergate Bay. Most of these are patrolled by RNLI lifeguards during the summer season. The coastal footpath delivers some stunning walks and incredible views through this dramatic section of coastline. Hustyns, the luxury spa and resort centre, is only 10 minutes away by car and offers day passes to the gym and swimming pool as well as a variety of beauty and spa treatments. There is also a first class restaurant. The golf courses of St Enodoc and Trevose are within easy reach. These days Newquay's excellent surfing waters are the town's main industry, whereas it once used to be a major export port for the county's mining efforts as well as a north coast port for pilchard fisheries. Fistral Beach holds many surfing competitions throughout the year, and also hosts Run to the Sun over May Bank holiday, a VW and Custom Car Show. Both the Women's and Men's Gig Championships are held here, as is a balloon festival and surf and lifesaving events. Newquay Zoo now houses 130 different species in sub tropical gardens in the centre of the town. Neighbouring Watergate Bay and The Extreme Academy offers you a 'ski resort on a beach' and a plethora of activities to keep even the most active occupied. Fifteen Cornwall, founded by Jamie Oliver in 2002, sits on top of the two mile beach at Watergate offering inspirational views for the young chefs and professionals to create fantastic menus from local and seasonal produce. The Lappa Valley Steam Railway just outside Newquay offers both the old and young an interesting day out. Newquay Airport has made the north coast one of the easiest places in Cornwall to get to, with regular flights from various locations across the UK. The town also has an Aquarium, a Waterworld and numerous immensely pretty beaches for the less active. Trerice, run by the National Trust and 3 miles outside of the town, is an Elizabethan manor house and garden with restricted winter opening times. Wadebridge, once a market town, is now more widely known as being part of The Camel Trail, the cycle route out to Padstow from the depths of Bodmin Moor on the old tramway route. You can hire a bike at the start of the trail and cycle to Padstow, now famous for being home to Rick Stein's The Seafood Restaurant, amongst others which the celebrity chef owns in the town. From Padstow you could take a boat trip across the Camel Estuary to Rock and lounge on the beautiful beach that stretches all the way around to Daymer Bay. The National Lobster Hatchery neighbours Rick Stein's empire in Padstow. The Royal Cornwall Show ground at Wadebridge hosts the county show every June, come rain or shine, and is opened each year by a member of the Royal Family. Cornish farmers have had to diversify in recent years and so has the Show, but they have kept their traditional roots with steam engines being shown next to the shiny new high-tech tractors. It's not every day you get to see formation JCB digger dancing in the main ring. The National Trust have three properties nearby - Lanhydrock House, Trerice and Carnewas & Bedruthan Steps. Slightly further afield is the Eden Project in St Austell, famously built in a disused china clay pit. 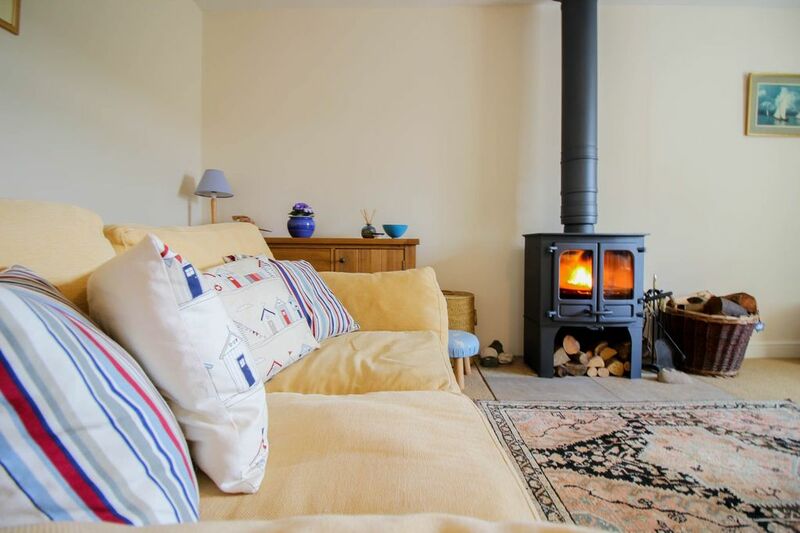 Electricity, heating, one basket of logs for the woodburner, bed linen and towels are included but you will need to provide your own beach and dog towels Discounts available for couples staying for 7 nights outside the peak season, using one room only.